Here's where I thought we would get into some real biochemistry to explore the pathways involved in breaking down plastics. Turns out, the material gets a little heavy for the scope of this blog (lots of experimental conditions and little consensus) so there will be a little biochemistry and then we are going to turn to properly biodegradable plastics produced by micro-organisms. Lets first return to my favorite plastic, polyurethane and specifically the polyester type of polyurethane (PU) that is more amendable to bio-degradation (see the previous blog for help with understanding the why!). It was evident from the beginning of polyurethane production and use, that the material was susceptible to fungal degradation. Tests were done with purified enzymes and in soil where fungal communities were discovered to have a number of PU degrading species. However the best results were obtained when a biostimulant was added such as Impranil DNT, a readily digestible form of PU - sort of like baby formula for fungi. The addition of cultures of known PU biodegrading fungi was also helpful in increasing biodegradation of PU by native soil fungi. The enzymes were thought to be extracellular (i.e. pumped out of the fungus) and to be a combination of ones that could cut bonds in the middle of the polymer at random positions (endoenzymes) and those that chopped off monomers from the end of the polymer chain (exoenzymes). In general, an additive like yeast extract also needed to be added as a carbon source to create more extensive degradation, though fungi that could utilize PU as the sole carbon source were identified (Howard et al., 2012). Recently, an endophytic fungus from the Amazon rainforest has been identified that is able to efficiently use PU alone as a carbon source without additives (Russell et al., 2011). Although this is promising, it has as only been tested in small scale laboratory experiments (with Impranil DNT) and I'm not sure how it compares with the fungi that were identified earlier (Howard, 2012). On the bacterial side, several species have been identified as degrading PU. Enzymes from the Pseudomonas genus have been characterized and fall into a class that resemble lipolases which are enzymes that degrade lipids (fats). Interestingly, when the sequences of the genes are compared to each other and to other lipolases, it was shown that they come from genetically diverse backgrounds and do not have a common parent. This suggests that several branches of the evolutionary tree thought up the same idea at different time points (Howard, 2012). However, all these test have been done under laboratory like conditions on a small scale and the general impression from the literature is that most plastic that is currently produced cannot be degraded sufficiently efficiently to make industrial efforts economical. Efforts are therefore turning towards more ecofriendly biodegradable plastics and also to plastics produced from renewable sources (biopolymers) rather than from petrochemicals. So lets leave the degradation of plastics and turn to plastic biosynthesis. Since we are in the business of investigating what micro-organisms can do for us, is it really true that bacteria or fungi can make plastic? YES IT IS! Many biopolymers use micro-organisms in a fermentation step to breakdown a feedstock such as corn or mollases to produce a monomer. Examples of these plastic monomers include lactic acid used in polylactic acid (PLA) plastic and succinic acid used in Poly(butylene succinate adipate)( PBSA) (Wolf 2005). However, only one type of plastic [polyhydroxy alkanoates (PHA)] is produced directly by bacteria (Figure 1 and 2). Just like there any many types of PU or polyethylene, there are many types of PHA. Monomer units of different types of PHA are shown in figure 3. Polyhydroxybutyrate (PHB/PH3B) which is a PHA, was first discovered as far back as 1926 (Castilho et al, 2009), but because of the expense of production and the lack of technology and the bliss of ignorance of the consequences of using oil for everything, the discovery languished. Recently with making our world into a rubbish pit by filling it with landfills, the finite supply of oil and the worsening consequences of churning out CO2, much more effort has been devoted to research into bringing down the costs of bioplastic production. As we are environmentally focused (reduce, reuse, recycle) lets first look at the use of inexpensive feedstocks as one of the aspects for bringing down production costs of PHA. Feedstock can either be liquid and used in submerged fermenation processes (SMF) or from more solid material used in solid state fermentation (SSF) processes. SMF is where the liquid feedstock is mixed in with the bacteria in one large agitating container. A few SMF feedstocks include molasses and sugar cane liquor (by-products of sugar production), sugar (which while not as cheap as molasses is less expensive than glucose), starch based substances such as wheat pearlings (the bran husk from the wheat kernel that is removed by rollers in a process known as pearling), cellulosic materials (e.g. sugar cane bagasse hydrolysate; the leftovers from sugar cane stalks after the sugar has been removed), hemicellulosic substances (e.g. xylose; a monosaccharide in hemicellulose found for example in corn husks and wood pulping byproducts) and whey based waste material (a large and mostly wasted resource from the dairy industry). SMF feedstocks also include organic waste matter such as swine waste liquor, malt waste from spent barley, millet refuse from brewing brewing and waste from olive oil mills. There is therefore great potential to couple some of these industries with PHA production. SSF feestocks on the other hand, used moist solid particles in substrate beds where the feedstock is the support surface (i.e. the surface on which the bacteria grow). SSF is a potential alternative for disposal of agricultural waste such as rice bran, cassava bagasse and cakes from vegetable oil extraction. Instead of needing to dispose of these via incineration or landfill, they could become an extra source of revenue. PHA productivity in grams of PHA per kilogram feedstock per hour can range from 0.02 to 2.57 g/kg/h (Castilho et al, 2009). The top producer in the article by Castilho et al., 2009, used recombinant E. coli containing PHB genes from the bacterium A. latus in a whey + salts + citric acid + trace metals SMF fed-batch reactor (read on for what this is!). The experiments were done by Ahn et al, 2000. A recombinant micro-organism means that it has an engineered genetic composition compared with its original state. 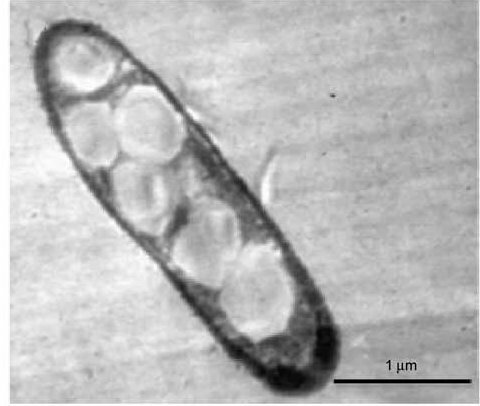 In this case, a plasmid with PHB synthesis genes from the bacterium Alcaligenes latus (now known as Azahydromonas lata) were added to the E. coli bacteria on a plasmid. A plasmid is a (relatively) small piece of circular DNA that contains all the necessary components for autonomous replication within the bacteria. Genes of choice can be inserted into the DNA of the plasmid and the plasmid can then be inserted into a new bacterium so that the effect of the genes can be studied. Certain strains of E. coli are laboratory work horses, allowing the genes of more obscure, more finicky bacteria to be studied more easily. The autonomous replication property of a plasmid means that several copies of the plasmid exist within the bacteria and when the bacteria divides, some of them will remain in each daughter cell, ensuring that the bacteria retain the ability to synthesize PHB. So now we have the E. coli PHB factory, what happens next? Ahn et al, 2000 use a fed batch reactor. This is a container with a stirring mechanism and probes by which the oxygen and pH can be monitored. At the beginning of fermentation, less than half the maximum volume of culture was added. As the lactose concentration fell (lactose is the sugar carbon source utilized from the whey by the bacteria) the pH rose and more whey feedstock was added to bring the pH back down, thus increasing the volume in the reactor. The authors found that the oxygen concentration had a significant role in PHB productivity. The growth of the bacteria could be divided into 2 phases; a fast growth phase where high (40%) oxygen was optimal to achieve high bacterial density and a slow growth phase with lower oxygen levels where PHB production increased. This makes sense as PHB is stored as an energy reserve during lean times like low oxygen levels. They also found that PHB production was highest during oxygen lowering so that with a step wise decrease in oxygen concentration from 40% to 30% to 15%, the highest PHB productivity of 2.57g/kg/L was achieved. The only disappointment for me with this study, was that the whey feedstock was not obtained from a dairy but from bought whey powder so the experiments was not as "real" world as the could have been. After expression in bacteria, the PHA must be extracted and this is estimated to be up to 50% of the cost of PHA production (Fiorese et al, 2009). In comparison with biosynthesis, the extraction process has been much less researched. Kunasundari and Sudesh, 2011 provide a review. The extraction process consists of pretreatment of the collected bacteria to weaken the cell wall and cell membrane (for an understanding of bacterial cell structure, take a look here). Following pretreatment, an extraction process is used to isolate the PHA from the other cell components. Extraction has commonly been done with organic solvents such as chloroform and this clearly presents enviromental consequences as well as being uneconomical unless the solvents can be recycled. Fiorese et al, 2009 use 1,2-propylene carbonate in the extraction process which is a much less toxic solvent than something like chloroform and can also be recycled, thus reducing costs. Major factors of any extraction process are purity, the affect on the homogeneity and breakdown of the PHA (i.e. shortening of the plastic polymer molecules). The standards for these qualities will depend on the end product for which the PHA is to be used. Other extraction procedures being investigated include chemical or enzymatic disruption and mechanical disruption. Each method has advantages and drawbacks. For example, enzymatic digestion involves mild conditions and therefore provide an environment for a high molecular weight, high homogeneity and pure end product. On the downside, enzymes are expensive to produce and have finite life times. Mechanical disruption is advantageous because no chemicals are involved, therefore no contaminants are added that need to be removed later and there are no added polluting solvents to deal with. However, there is a high capital investment cost of the mechanical disruption machinery, processing times are long to ensure maximum disruption and scale up is difficult. As of 2009, PHA plastic is between 3-17 times more expensive to produce than petrochemical based plastics (Castilho et al., 2009). Having said that, there are a couple of companies producing PHA industrially. Metabolix in Cambridge, MA, USA, produced 50,000 tons of its PHB product Mirel in alliance with ADM between 2004 and 2012 (it has since closed). "Meredian, Inc has a pilot plant in Georgia, USA that produces 13,600 metric tons per year of PHA. Construction is beginning at the site for a plant that will produce 91,000 metric tons per year of PHA. Tianjin Green Bioscience and DSM operate a 10,000 metric ton per year PHA plant in China. Tianan Biologic Material Co. is boosting its capacity in China to 10,000 metric tons per year. About a dozen other companies operate lab or pilot scale PHA facilities"(Smock, 2012). Can PHA plastics be used in the same way as petroleum based plastics? Currently, the main application of PHA is used for making thin plastic films such as plastic bags and food packaging which is an application that otherwises uses polyethylene or polyurethane plastics. With further research, PHA plastics could also be used for other products such as tissue engineering materials, bioimplant materials and smart materials (Chen, 2010). The major advantage of PHAs produced from biowaste, especially when coupled with a dairy or sugar production plant for example, is that they are easily biodegradable. When (yes I do say when) the cost of their production is brought down sufficiently and their properties altered, they could be a significant source of plastic. While this post has been about PHA (mainly), biopolymers produced from waste products initially broken down by micro-organisms and then made into polymers through other processes, is also an alternative technology. Some of these biopolymers are not biodegradable. In 2005, the European Commission provided an interesting (and long) report on the "Techno-economic Feasibility of Large scale Production of Bio-based Polymersin Europe" (Wolf, 2005). It provides exactly what the title says and generally comes out on the side of biobased plastics as necessary for the environment, company reputations (being green is good marketing) and for scientific innovation, highlighting that green technology is about much more the reducing our environmental impact and the safety of future generations - as if this wasn't enough! Next post: Feb 28th. Right now the subject is a toss up - more on PHA or heading to the ocean to look at our plastic pollution there. Ahn, W., S. Park and S. Lee (2000). "Production of poly(3-hydroxybutyrate) by fedbatchculture of recombinant Escherichia coli with a highly concentrated wheysolution." Appl. Environ. Microbiol.. 66: 3624-3627. Castilho, L. R., D. A. Mitchell and D. M. Freire (2009). "Production of polyhydroxyalkanoates (PHAs) from waste materials and by-products by submerged and solid-state fermentation." Bioresour Technol 100(23): 5996-6009. Chen, G.-Q., Ed. (2010). 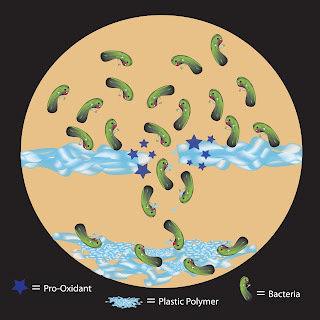 Plastics from Bacteria:Natural Functions and Applications (Google eBook). Microbiology Monographs. Fiorese, M., F. Freitas, J. Pais, G. de Araga˜o and M. Reis (2009). "Recovery of polyhydroxybutyrate (PHB) from Cupriavidus necator biomass by solvent extraction with 1,2-propylene carbonate." Eng. Life Sci. 9(6): 454-461. Howard, G. (2012). Polyurethane Biodegradation. 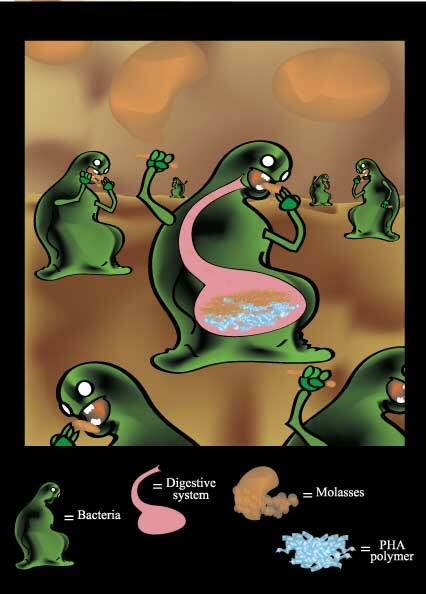 Microbial Degradation of Xenobiotics. S. Singh. Berlin, Heidelberg, Springer-Verlag 371-392. Kunasundari, B. and K. Sudesh (2011). "Isolation and recovery of microbial polyhydroxyalkanoates." eXPRESS Polymer Letters 5(7): 620-634. Russell, J. R., J. Huang, P. Anand, K. Kucera, A. G. Sandoval, K. W. Dantzler, D. Hickman, J. Jee, F. M. Kimovec, D. Koppstein, D. H. Marks, P. A. Mittermiller, S. J. Núñez, M. Santiago, M. A. Townes, M. Vishnevetsky, N. E. Williams, M. P. N. Vargas, L.-A. Boulanger, C. Bascom-Slack and S. A. Strobel (2011). "Biodegradation of Polyester Polyurethane by Endophytic Fungi." Applied and Environmental Microbiology 77(17): 6076-6084. Wolf, O., Ed. (2005). Techno-economic Feasibility of Large scale Production of Bio-based Polymers in Europe. The other day, I was confronted by a non-draining bathroom sink. I googled it up and read that spooning down a bit of baking soda followed by apple cider vinegar, does wonders. And it does. You don't even need a spoon. I poured baking soda down, followed by the vinegar and enjoyed the frothing reaction. After several pours, the sink drained beautifully, not an ugly chemical in sight. Tip about baking soda shampoo from last post. I found that my hair does best on 1.5 tablespoons of backing soda to 2 cups of water. Less or more gives a less glossy result. Your hair could be different! My first post covered general topics of the capabilities of micro-organisms with regard to the manufacture and destruction of plastics. Now for the beginning of the slightly more nitty gritty. I'll start off with what plastics are, followed by what makes them amendable (or not) to bio-degradation. Lastly we'll see if the technology is at a stage where it can be used on an industrial scale. Plastic forms such a daily part of our lives – packaging, toys, electronics, furniture, clothing (fleece, waterproof clothing), shoes, building materials; the list is endless. And when you think of the different forms plastic takes, the diversity is mind boggling; thin and foldable, thick and rigid, filled with air, thread like, crinkly, fun to stamp on (i.e. bubble wrap) etc. Plastics can be divided into two types. 1. Thermoplastics and 2. Thermoset plastics. Thermoplastics are formed from alkenes. 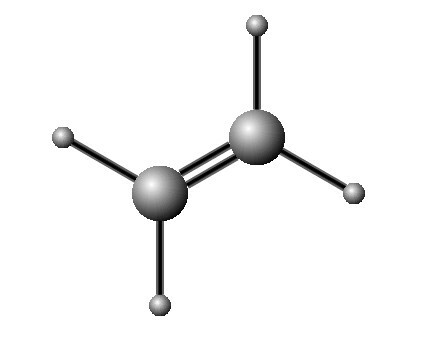 The simplest alkene is ethylene (CH2=CH2) (also called ethene) and is shown in figure 1A. 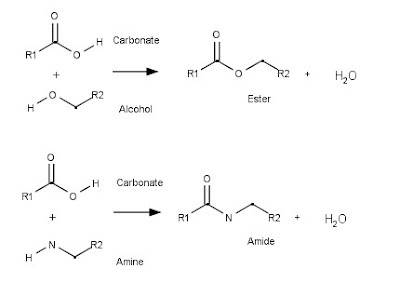 During polymerization the double bond between the two carbons is broken, resulting in a single bond between the two carbons and the use of the two halves of the second single bond to form two new single bonds with two new ethylene molecules on either side of the original ethylene. Thus a chain of ethylene molecules -(CH-CH)n- as in figure 1B is generated. This is called polyethylene or PE. Other thermoplastics are polyvinyl chloride and polystyrene. Modification of the monomer or mixing two or more different monomers together in the chain, changes the properties of the end plasic such as its temperature tolerance or flexibility. Modification of the chain also changes the end plastic. For example, by adding side chains to the central strain of PE, causes the chains to pack less tightly, which decrease density creating low density polyethylene (LDEP - figure 2, rrepresentative illustration) and allows it to be stretched into thin sheets such as in your supermarket plastic bag. The single carbon bond in thermoplastics is stable, resistant to degradation and hydrolytic cleavage which is the cleavage of chemical bonds by the use of water. Thermoplastics have been generally regarded as non-biodegradable. Unfortunately, they make up the majority of our plastic use. In 2004 thermoplastics made up 92% of the distributed plastic resins in the USA (ref 1). The second type of plastic are thermoset plastics. 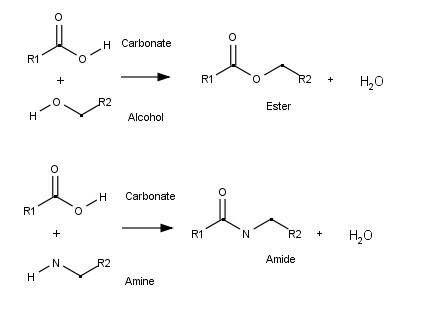 These plastics are made by joining an alcohol (R-OH) or amine (R-NH2) with a carbonate group (R-C(O)OH) in a process known as condensation as a water molecule is released and an ester (-C(O)OC(H2)-.or amide (-C(O)NC(H2)-) is formed (figure 3). Examples of thermoset plastics are polyesters and polyurethanes. 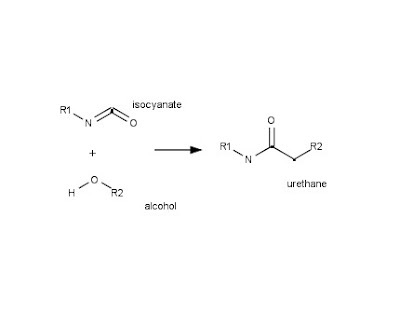 Urethane is little more complex as it involves the reaction of an isocynate group with an alcohol group to generate a urethane group (figure 4). You will notice that no water is produced and this is not a condensation reaction but the result is an amide-ester bond or urethane bond. The small black dots in the structures represent carbons and the R groups, the rest of the molecule. R1 and R2 in polyurethane would then need contain another isocyanate and alcohol reactive group attached to whatever structure that was inbetween such as an alky or aryl group (figure 5). 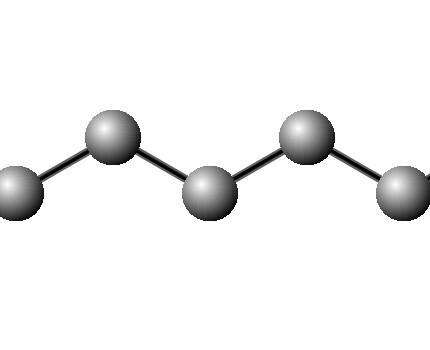 In this way, both ends of the molecule could react to form a polyurethane chain. From the differences in the R groups, its apparent that the polyurethanes can encompass great diversity (ref 2). The ester, amide or urethane link is susceptible to enzymes produced by bacteria and fungi and is thus biodegradable or at least more biodegradable than the thermoplastics. Now that we have some basic ideas about plastic, lets see how biodegradation works. We know that thermoset plastics, because of their chemical composition are biodegradeable. Does that mean that addition of a few choice micro-organisms will cause automatic meltdown? Not quite. Polyesters for example consist of two types: aliphatic and aromatic polyesters. Though there is some controversy, aliphatic polyesters are thought to be biodegradable but aromatic polyesters are not (ref 1). Aromatic polyesters contain six carbon rings and form plastics used to make carpet, clothing and soda bottles. Aliphatic polyesters are rather weak plastics and are used to make medical and scientific items such as tissue scaffolds and dissolving drug delivery systems. 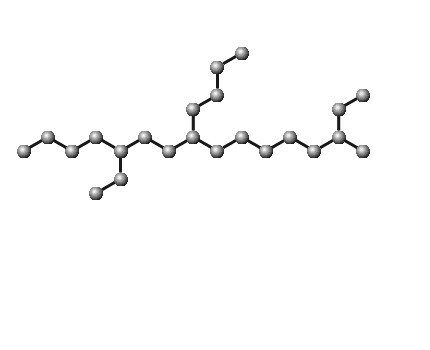 Polyurethane is a different type of plastic to polyester (though sometime refered to as the polyester polyurethane) and is used in many products including furniture, paints and construction materials and its biodegradation has been shown to be due to the microbial destruction of the ester bonds (ref 2). Additionally, when plastics are made, additives are blended that improve their enviromental stability such as their resistance to heat and light and these generally hinder biodegradation. In biodegradation research, ways in which plastic stability can be maintained while improving susceptibility to micro-organisms are investigated. Various ways have also been devised to improve the poor biodegradation of thermoplastics. Before micro-organisms can attack the long polymer chains, they need to be transformed into bite size pieces of 500 Da or less. As many plastics are resistant to conditions that allow the chains to be broken up, additives called pro-oxidants are mixed in with the polymers that make the plastics hydrophilic and catalyze the breakdown of the hydrocarbon chains during photolysis or thermolysis (see title figure above). Pro-oxidants consist of transient metal ions (e.g cobalt or manganese) added in the form of an organic ligand complex. The chemistry is beyond the scope of this blog (for now!) but see ref 3 if you want to dig in. In addition to pro-oxidants, other truly biodegradable material such as starch are added to the polymers and this enhances the biodegradation process. What are the bacteria and fungi that are used to chew up plastics once it is in a compatible form? Of course its variable! Without getting too specific about genus and species, lets look at two examples - the thermoplastic polyethylene and the thermoset plastic polyurethane. PE takes up to 1000 years to degrade in the environment and makes up 64% of the plastic mass produce each year globally (ref. 4). To put that in perspective 500,000,000 (500 billion) to 1,000,000,000,000 (1 trillion) plastic bags are used annually, world wide. And thats not counting the PE thats used to make all the other products. It threatens wildlife, domestic life, marine life and gets into the food chain as its broken down by the action of heat and sunlight. Only a fraction is recycled (ref. 4). In fact, the EPA says that only 8% of all plastic is recycled! As mentioned above, because of the lack of atoms that are subject to electrophilic or nucleophilic attack such as oxgen and nitrogen, PE is regarded as essentially resistant to microbial attack. Pro-oxidants incorporated into the PE during manufacture and resident mainly in pockets of the PE that are less crystalline and more amorphous, are then used post-consumer to break up the chains of PE using heat or light. The broken up chains are susceptible to microbial digestion (see title figure at top of blog). For example, the bacteria Rhodococcous rhodocrous, is part of a genus able to metabolise a diverse array of substances due to their robust physiology and large genome that incorporates an array of catabolic genes. These are genes that make products able to break down (catabolise) many different substances and this genus is used for other environmental purposes as well as PE degredation (ref 5). A comprehensive table of the different bacterium tried is given in reference 3 and 4 and the authors admit that while consumption occurs in the pockets of PE broken up by pro-oxidant action, further, more complete degradation does not occur. Some success was met mixing pro-oxidant heat treated PE into compost where up to 70% conversion of PE to carbon dioxide was achieved, perhaps because diverse populations of bacteria are present able to produce a more diverse set of enzymes and thus support each other. However from the review article (ref 4) published this year, it can be seen that while some bio-degradation is possible, we are a long way from having a commercially viable process for bio-degradation of PE. For the small dent it can make in improving our current and future environment - keep reaching for your canvas bags and avoid extra packaging wherever possible. Biodegradation of Thermoset plastic, polyurethane. So much for PE! What about polyurethane? In 2004, 2,722,000 tons of polyurethane was produced in the United States which encompasses 25% of the market. To put that more visually, the average African male elephant weighs 12,000lbs. There are 2000lbs in a US ton. So, in 2004 about 227 African Elephants could have been modeled from of polyurethane. And thats only a quarter...in 2004. Production has assuredly increased since then. The mind boggles. microspora, which, remarkably can live on PU alone. This suggests that these type of fungi are a source of efficient PU biodegraders. From these two examples we can summarize that PE is some way from being biodegradable by current techniques and though PU is much further along, the technology is still at the research stage. Is bioremediation of soils of plastics of any sort a commercial venture yet? It turns out the my two examples give a rough idea of the state of affair - lots of encouraging research but no large scale applications yet. We live in hope. When plastic goes, what do you get instead? Ok, popping the plastic landfill balloon needs a sharper needle, but say we did have a large scale technology available - what would happen to the plastic once the microbes get their proverbial teeth into it? Well, boys and girls, thats the story for next time! Await the delights, January 30th! or there abouts. 1. Zheng, Y., E.K. Yanful, and A.S. Bassi, A review of plastic waste biodegradation. Crit Rev Biotechnol, 2005. 25(4): p. 243-50. 2. Howard, G., Polyurethane Biodegradation, in Microbial Degradation of Xenobiotics, S. Singh, Editor. 2012, Springer-Verlag Berlin, Heidelberg. p. 371-392. 3. Koutny, M., J. Lemaire, and A.M. Delort, Biodegradation of polyethylene films with prooxidant additives. Chemosphere, 2006. 64(8): p. 1243-52. 4. Sangale, M., M. Shahnawaz, and A. Ade, A Review on Biodegradation of Polythene: The Microbial Approach. Bioremediation & Biodegradation, 2012. 3(10). 5. Larkin, M.J., L.A. Kulakov, and C.C. Allen, Biodegradation and Rhodococcus--masters of catabolic versatility. Curr Opin Biotechnol, 2005. 16(3): p. 282-90. 6. Russell, J.R., et al., Biodegradation of Polyester Polyurethane by Endophytic Fungi. Applied and Environmental Microbiology, 2011. 77(17): p. 6076-6084. Lifestyle magic - the soda wash.
Wash your hair with baking soda. 2 tablespoons of soda to 2-3 cups of water. Use as much or little as you need per wash. I've been doing this for the last 6 weeks and I'm really pleased. I have fine, fly away hair (alas, NOT a crowning glory) that needs frequent washing. My hair is as clean and fluffy as with any shampoo BUT - less comes out during brushing and my scalp does not itch as it often did with shampoos. Neither do I need conditioner. If you do, an altnative is dilute apple cider vinegar with honey added optionally.